Where did the “Drug Crisis Start?” Since 1980 deaths from drug overdoses in the USA have steadily increased every year. In 1999, the per capita rate of drug deaths (Based on 100,000 people) was 6.1 for all drugs while the rate of deaths from opioids was 2.9. In 2017, the rate was 21.7 for all drugs and 14.9 percent for opioids. Why are so many dying from Opioids? This article in the Guardian states that the main reason for the increases was the epidemic created by the pharmaceutical industry in pushing drugs for pain relief for very common problems such as arthritis and back pain. Thus, while we arrest drug dealers, the real culprits go scott free and become billionaires on the suffering of the US population. It should have been obvious to the doctors, pharmaceutical executives, FDA and all of our political leaders. However, truth and reality are too often forgotten when it comes to making profits. Greed trumps all other considerations and millions of Americans have become hooked on painkillers to alleviate symptoms that can often be treated with much simpler and more effective solutions. In this world of juxtaposition and dialectical opposites, there does not seem to be any two individuals who could be further apart than Ricky Van Shelton’s Simple Man and Goethe’s Faust. However, looks and paradigms can often be deceiving. A Simple Man (since we don’t know his actual name he will remain a “Simple Man”) is a good old country boy. We presume he is a blue collar worker, never went to college and probably does some hard manual labor. He loves to hunt, fish and drink with Bubba, Billy Joe and the other guys. He is everyman’s down to earth guy. He does not worry about the future but takes one day at a time. His thoughts are more likely to meander around his next fishing hole than to try to plumb the meaning of the universe. Faust for all apparent purposes has not a thing in common with a Simple Man. Faust is complex, morose, introverted, elderly and a true intellectual. No doubt Faust went to Oxford or some high class German Academy. He ranked not only first in his class but first in every academic endeavor he ever undertook. He went on to become the most esteemed Doctor of Philosophy in German and European history. He loves to read, write, compose and publish esoteric treatises on the nature of the universe and the meaning of reality. Faust is first among thinkers and intellectuals. Well, there you have it. Two diametrically opposed male personalities. A Simple Man and his mirror image Faust. But beware! Appearances can be deceiving. Things may not always be as they seem. Could it be that Faust and a Simple Man have more in common than you would think? Follow me as we examine a dialogue between a Simple Man and his wife and a dialogue between Faust and Mephistopheles. Note similarities. Note differences. A Simple Man wants to find peace of mind and his “baby” does not seem to understand his real needs. Mephistopheles finds Faust also distraught and agitated. Despite Faust’s soaring intellect, he is unhappy with his life and the success he has achieved. He responds to Mephistopheles, the devil, who purports to be able to give Faust the happiness he desires. Why don’t you give me a break. All to know, all in earth and heaven. Binding my soul to life always dreary. Both men are worn down and worn out. Both are feeling hopeless. Again the light of a new day ! Above me hover and give me rest? Cursed be all of man’s vile race ! Cursed be the chains which bind him in his place! Cursed be visions false, deceiving! Cursed the folly of believing! Cursed be dreams of love or hate ! Cursed be souls with joy elate. Cursed be science, prayer, and faith! Cursed my fate in life and death! Science, prayer and faith cannot provide the peace each man requires. Faust has given up on intellectual solutions while a Simple Man still believes in the joys of work, land and food. Of heart and of sense. What both Faust and a Simple Man really want is love. Its faint but golden ray. Faust is more eloquent but a Simple Man hits the nail on the head. I just want a soft woman and a warm bed. Both the opera and the song leave you with the impression that neither Faust nor a Simple Man obtains the life they want to live. Something is out of kilter that cannot be set right. Tragic expectations on the part of both a Simple Man and Faust are never fulfilled in the real world. Neither books nor hunting, nor ideas nor actions enable either man to find what they are looking for. A Zen Master happens to be walking by and overhears the laments of both Faust and a Simple Man. He notes the apparent remorse and confusion of their musings. He is struck by their sadness and attempts to offer some wisdom which he feels might be consoling. Life cannot be lived through others. The secret of happiness is to let go of your expectations for happiness and to realize that happiness is only obtained through inner wisdom and not through external ideas or things or people. You Faust thought that ideas and your intellect could bring you happiness. When this mode failed, you gave your soul up for the immediate pleasures of the world. You failed in both efforts. You Simple Man thought that you could escape responsibility for your happiness. You thought your wife would provide you the succor and tranquility which your lifestyle necessitated. You thought she would be the warm pillow and soft bed who would take care of your weary bones. You have also failed to find the peace you desired. Faust: I am half a man. Simple Man: And I the other half! Zen Master: Perhaps two halves make a whole. What similarities between a Simple Man and Faust did you find? What differences did you find? What if anything surprised you about their thoughts and needs? Do we think focus more on the differences between people than the similarities? Would it make a difference in how we view the world if we saw more similarities between people? Do you think you are very different from most people or very similar? Why? How have your differences and similarities affected your life? Ironically this song was written by a Northerner and first sung in New York City in 1859. The first shot was not fired in the Civil War until April 12, 1861 when the Confederates attacked Fort Sumter. I often heard this song when I was growing up since my mother and I were both born in Alabama. I was born in Fairfield, Alabama and my grandparents had a farm in Ensley, Alabama. Years later and the farm is now ancient history and Ensley is a bunch of suburban homes adjacent to Birmingham. The cow paths, chicken barn, pig sties and goat pens are long gone. The rolling dirt road that once led to the Farmers Grain and Feed store is now a paved two lane highway leading to Walmart and CVS. I remember many trips down this road beside my grandfather who always had a large quart canning jar full of ice and water and wrapped in a towel. When we arrived at the feed store, he would go in to purchase his feed and buy me an RC Cola from the metal soda box on the front dock. I would sit on the side of the feed store loading dock while the workers would pack his pickup truck with bags of grain and other assorted farm essentials. My grandfather would have a brief chat with the workers and we would be on our way back to his farm. My grandfather and grandmother lived in a Quonset hut that they purchased after the end of WW II. The hut was all metal and “rooms” were defined by hanging blankets. I do not remember any doors in the hut except the single door leading outside. Beyond this door was the path that would take you directly to the outhouse. Other paths branched off this main path to the barn and various animal areas. My grandfather and grandmother always lived frugally but they did not scrimp on the food. Breakfast would be grits, brains, bacon and eggs. Lunch would be fried chicken with collard greens and large baking powder biscuits. Supper would be fried potatoes, green beans and either roast pork or perhaps barbecued goat. Fridays we would eat catfish and okra. I never tired of my grandmother’s southern cooking. My grandfather supplemented his meager income by working at the Birmingham Steel mill. I remember when we would go to Birmingham at night. The sky would be full of smoke and sparks from the various steel mills in the city. The steel mills dominated the city architecture and they owned the night. As we came closer to one of the mills, we would soon see the large red hot ingots lying on their side cooling off in the mill yard. Occasionally, we could see the huge ladles of red hot ore pouring out their contents into the casting molds. Sparks would fly everywhere and the night sky would be lit up with flames streaking hundreds of feet into the heavens. It was almost like a fireworks show that went on night after night. I left the mills and Alabama when I left home in 1964 thinking that I would probably never see either of them again. I was wrong though. remained. Civic minded leaders in a spirit of trying to capture history decided to turn this last steel mill into a museum. Later on in my life, I toured this museum and visited the various plant areas but it was not the same anymore. The plant that had killed hundreds of men and took my grandfather’s left foot was now lifeless. In my imagination, I could see shadows of the dead men who had sweated in the heat of the blast furnaces and stoked coal to feed the hunger of the ovens for fuel and a growing nation for automobiles. A steel mill that had once been a dangerous fiery roaring tiger was now simply a large cavernous rusty building that echoed in my mind with the mute sounds of the past. Years after my first marriage was over, I took my second wife Karen down to Alabama to visit the remnants of the clan that my mother had belonged to. By this time, my grandparents were dead and most of my aunts and uncles were also deceased. I had never gone south with my first wife and so it had been years since I had visited Alabama. Karen and I had taken trips together to several different countries. We had been to England, Scotland, France, Germany and China. I warned her that going down South would be a culture shock. I was not surprised when she later told me that the “culture shock” she experienced in the South and with my relatives was greater than any she had experienced on our overseas trips including China. And of course, she saw numerous Confederate flags hanging from houses, pickup trucks and motorcycles. We even found a roadside stand where they were selling Confederate memorabilia and a large sign over the stand proudly proclaiming “Heritage Not Hate” as though the Civil War was about mint juleps and the right of slaves to sing and dance all night long. It became apparent to me why I never took my first wife to visit my relatives. Deep down inside, I was both appalled and ashamed at their ideas and behavior. During our visit Karen and I listened to more prejudice and bigotry then I had heard in years. I retreated to an almost catatonic state. I did not once broach the subject of racism or discrimination despite the abundant evidence of its pervasiveness. My normal outspokenness for intolerance was stilled in the onslaught of insults and harangues that I heard towards Blacks, Mexicans and other minorities. It was like a Gordian knot of discrimination and I did not know where to start unravelling it. On our way home, Karen and I discussed our mutual inability to speak out or take any action in the face of this prolific bigotry. I perhaps more than Karen was embarrassed that I had said and did nothing. I had become the silent person who fails to speak out. We can talk about moving on but I don’t think many of us realize how long it takes to change a culture and to really let go and move on. There have been and continue to be many changes in the Old South. Slavery has of course ended. The plantations are gone and Jim Crow rule is finally over. The Confederate Flag has even been taken down from most Southern State Capitals. The symbols and icons of the Old South are fast disappearing. Nevertheless, in the hearts and minds of many Southerners, you can still hear the refrains from Dixie repeating: “Old times there are not forgotten, Look Away, Look Away, Look Away, Dixie Land.” When it comes to the South, old times there are still not forgotten. Have you ever been down South? What was your experience? Do you have any roots in the South? If so, what changes have you seen over the years? What do you think it will take to make the South forget the Civil War and move on? The 1st of Gandhi’s Seven Social Sins: Wealth without Work. You worked hard, long and industriously. You attained as much education as you could absorb and afford. You treated all of your engagements with absolute honesty and scrupulousness. Wealth can be attained at a gambling casino or by winning a lottery if you are lucky enough. Wealth can be attained by suing someone and with the help of a lawyer who will thereby gain a percentage of your lawsuit. Wealth can be attained by finding some means of attaining a government handout for the remainder of your life. Admittedly, not all Americans subscribe to the second set of beliefs and fortunately there are many who still subscribe to the first. 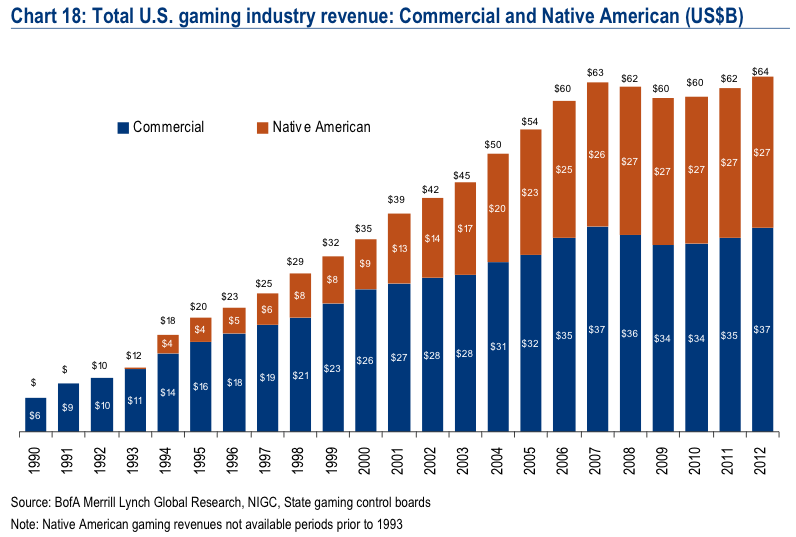 Nevertheless, I think you would be hard pressed to argue that gambling, casinos, government handouts and lawsuits have not multiplied exponentially over the past fifty years. The following are some charts which I think illustrate my points rather graphically. The nature of human beings is to want things fast and with a minimum of effort. This is normal and not to be thought of as deviant or unusual. However, as we age and develop more self-control and wisdom over our daily affairs, we learn to temper our desire for “Instant Pudding” with a more mature perspective. Noted quality guru, Dr. W.E. Deming maintained that people wanted “Instant Pudding.” For Deming this meant, change without effort, quality without work and cost improvements overnight. Added together, “Instant Pudding” was Dr. Deming’s metaphor for the desire to obtain results with a minimum investment of time and energy. Dr. Deming continually warned his clients that there was no “Instant Pudding” and change would take years of hard work and could not be accomplished without continued dedication and focus. Unfortunately our media and even schools today seem to emphasize the possibility of achieving success and wealth overnight. Sports stars are depicted as suddenly being offered incredible contracts. Movie stars are shown as going from unknown to overnight fame and fortune. Singers and musicians seem to suddenly achieve fame despite being barely out of their teens and in many cases barely into their teens. It would appear that everywhere we look fame, fortune and success happen overnight. All it takes is to be discovered. This might happen if you can get on American Idol or be found by the right booking agent or obtain a guest appearance on the Oprah Winfrey show. In some cases, all it takes is the right YouTube video to accomplish overnight success. One day Psi was an unknown Korean musician and in a few short weeks, he was celebrating success by a dinner in the White House and appearing on the Times Square New Year’s Eve celebration. How can anyone dispute that all that is required for fame and fortune is to be in the right place at the right time? Wealth Without Work: This includes playing the stock market; gambling; sweat-shop slavery; over-estimating one’s worth, like some heads of corporations drawing exorbitant salaries which are not always commensurate with the work they do. Gandhi’s idea originates from the ancient Indian practice of Tenant Farmers. The poor were made to slog on the farms while the rich raked in the profits. With capitalism and materialism spreading so rampantly around the world the grey area between an honest day’s hard work and sitting back and profiting from other people’s labor is growing wider. To conserve the resources of the world and share these resources equitably with all so that everyone can aspire to a good standard of living, Gandhi believed people should take only as much as they honestly need. The United States provides a typical example. The country spends an estimated $200 billion a year on manufacturing cigarettes, alcohol and allied products which harm people’s health. What the country spends in terms of providing medical and research facilities to provide and find cures for health hazards caused by over-indulgence in tobacco and alcohol is mind-blowing. There is enough for everyone’s need but not for everyone’s greed, Gandhi said. How I lost 25 lbs. in three weeks. Abs of steel in 2 weeks. Learn a language in ten days. Make 50,000 dollars in one month. How to pick the winning number for mega-millions. How to find your dream job in 21 days. I don’t have time to wait. I don’t have the patience to wait. I don’t want to spend my life waiting. I am entitled to success now. Why should I have to wait? I am as good as any of these rich successful people. If only everyone could see how good I really am, I would get the fame and fortune I deserve now. If you expect me to shut up and work hard, I will leave and go elsewhere. You need me more than I need you. I believe that Gandhi and many of my generation would find such ideas very peculiar not to mention that they contradict certain universal principles. Every time I hear of a new terrorist attack in this country or a new massacre at some workplace, I wonder how much the instigator was influenced by his or her desire for overnight fame and fortune. In some bizarre out-of-this-world thinking, these maniacs equate their picture on page one of the news with a sort of glory that is accomplished by their bizarre and cruel rampage. The more they kill or maim, the greater they think their glory will be. We can look for all the “reasons” why but we will never find any “good” reasons for anyone to take such anti-social actions against others. The paradox is that often the very people they hate are the ones they wanted attention or recognition from. Have you raised your children to believe in hard work? Are you one of the parents who want to make sure their kids have it easy? How do you know how much hard work is enough? Do you think you are entitled to success because or if you work hard? What other factors play a role in success? Is it fair that some people do not seem to have to work hard and yet still reap big rewards? Do people today have it too easy compared to the immigrants that founded this country?